If an electronic key or FOB goes missing restrict its access immediately and get notifications if the key holder attempts to access your electronic locking device. The most common method to install electronic locking on an existing door is typically an electric strike. While you are able to re-use the existing hardware in some cases this type of electronic lock requires a "storeroom style" lever set. 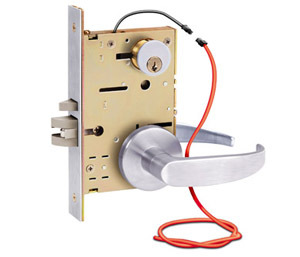 A mag lock can be installed and many styles of door or cabinets. They can be very effective however may be required to be tied into the fire alarm system. For new construction and some retrofits and electrified lever set or locking mechanism offers the most seamless and effective methof of electronic lock.